Yes, the customer is always right, but with Suzy, the customer is always on. Get real-time insights the moment you need them.. The speed of culture slows for no one, but Suzy is right there on its leading edge. 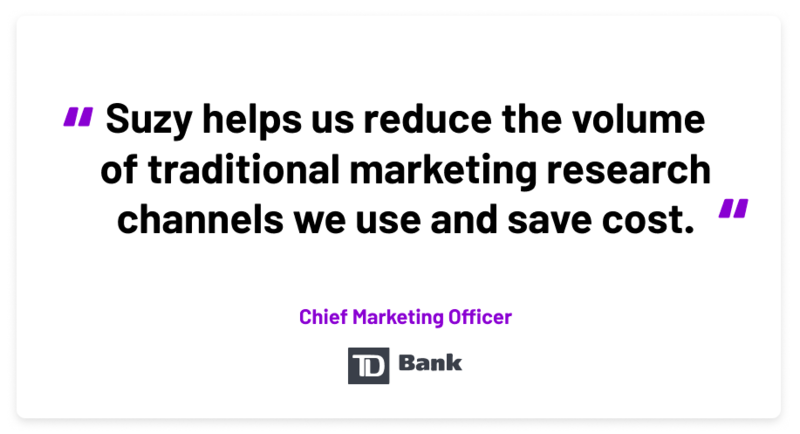 With the voice of over one million consumers at your fingertips, Suzy connects you to real-time insights to chart a smarter course forward. No more looking into the rearview at dated research. Business moves quickly. By the time you share your market research results, your insights could be irrelevant. Suzy lets you ask any question to your actual consumers and starts delivering responses instantly. Seize the moment with the ability to anticipate the trends that could soon become old news. Insights come from a variety of sources, just like the pressure you feel each day to turn them around quickly. With Suzy, you’re constantly connected to a network of over one million consumers to assist you in determining whether that insight is actionable or not. The speed of culture sends consumer insights into a perpetual state of flux. Suzy puts you in the driver’s seat with on-demand access to proprietary panels consisting of your actual customers for faster sprints to time-sensitive insights. Connect with your target audience in real time using our on-demand proprietary panel of more than one million consumers. Ask a question and immediately begin receiving answers and actionable insights in minutes...not days. Hit the bullseye every time with granular, custom targeting parameters. Ask follow-up questions and continue the conversation with the exact same consumer audience. Make better, more informed decisions…faster.